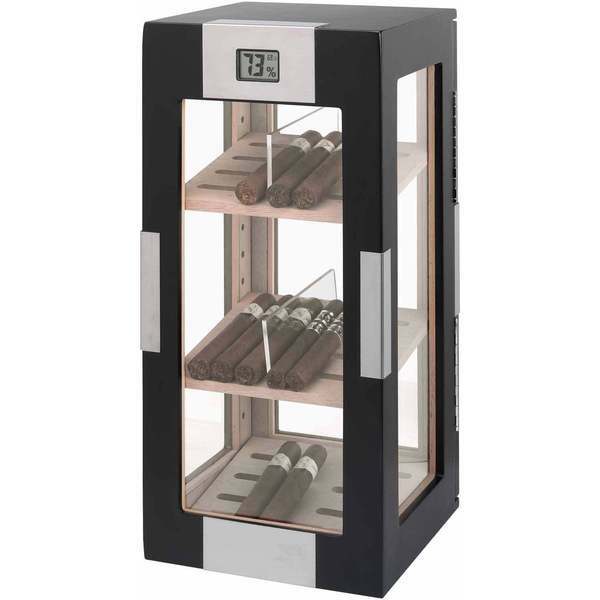 This Visol vertical humidor features three levels for you to display your cigars. It has a built-in digital hygrometer and comes with a humidifier as well. Husband loves this!!! It really keeps his cigars fresh and has plenty of room for several cigars. The only this is the opening door is in the back of the temperature reading...so its set up if you were to sell cigars and had this humidor on a display case so the customer can look at the cigars and then you the "seller" can distribute them. This is exactly what I was hoping for. It fits perfectly on the counter, not too large. So far it has done an excellent job at keeping my cigars feeling fresh. Also nice to have room for more than just a few cigars and at a great price. Would recommend. Directions of this unit aren't real clear. I'm unsure the humidity is correct or how to read the number as there are 2 #'s that display. I haven't added any cigars yet. I'll be calling customer service to figure out as aesthetically unit looks great. "Are the shelfs removable? Also is there a space under the bottom shelf were I can keep the humidty packets?" "Type of wood? Come on! This should be included in the description!" Hello lectric, this is dog wood. Have a great day!